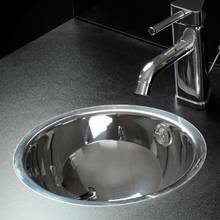 If you are looking for Quality, Choice, Style and Value then look no further than the amazing range of kitchen sinks from Reginox. Made in Holland, Reginox only uses the finest range of stainless steel and combines this with exceptional quality control procedures to ensure all products are of the highest quality. 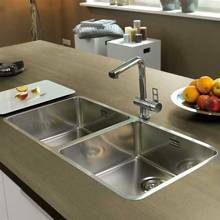 With a massive range of kitchen sink models to choose from you are bound to find the ideal model for you. Have a look at stainless steel, ceramic or granite. Single bowl, 1.5 bowl or double bowl kitchen sinks. Inset or Undermounted. A consideration when purchasing a kitchen sink should also be the aftersales service available, should anything go wrong. Reginox Stainless Steel sinks carry a Lifetime Guarantee. Reginox Granite sinks carry a 10 Year Guarantee and Reginox Ceramic sinks carry a 10 Year Guarantee. 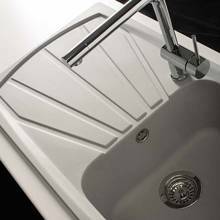 Although most Reginox sink models are produced in Holland they do have a UK support centre who are available to assist with warranty claims and spare part requests. 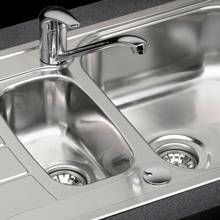 Sinks-Taps.com are a major stockist of Reginox kitchen sinks and have been for more than 15 years. We highly recommend the Reginox products and can assure you, you are buying a quality product for your kitchen that will provide years of trouble free service.